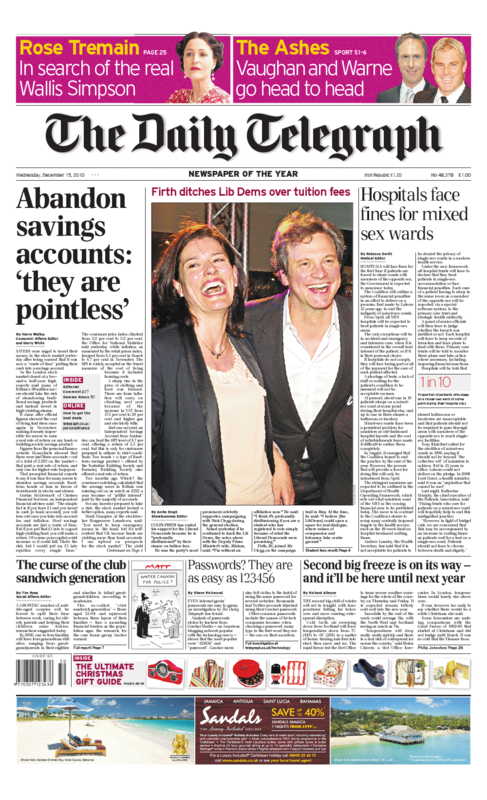 The Telegraph – “Abandon savings accounts: ‘they are pointless’” – An interesting and uncovered topic, albeit with quite a weak source. The paper leads with one of the most fundamental issues in an economic recovery – the need for people to stop spending and reinvest their capital in an expanding market. A number of irrelevant organisations and websites have apparently said it is “pointless” to keep your money in savings as you lose money after tax and inflation. The question, however, is whether the British public feels confident enough to reinvest in more risky forms of spending. The Japanese economy struggled with this for decades – all the signs were that people should be spending more but they just kept saving and the economy never grew. Fingers crossed the Brits are more self-confident. Whether you agree with the stance of the Mail or not, you can appreciate that it is very good at what it does. In tonight’s piece about the suicide bomber in Sweden the paper uses brilliant juxtaposition of a picture of three beautiful young children and text which uses phrases like “a mind warped by religious hatred” to create a picture so compelling that even those who disagree with the paper’s standpoint will find it hard to dispute. It is asking a very simple question – “Why would a man leave these children behind and try to blow up hundreds of people?” A question so difficult no one would like to respond to. 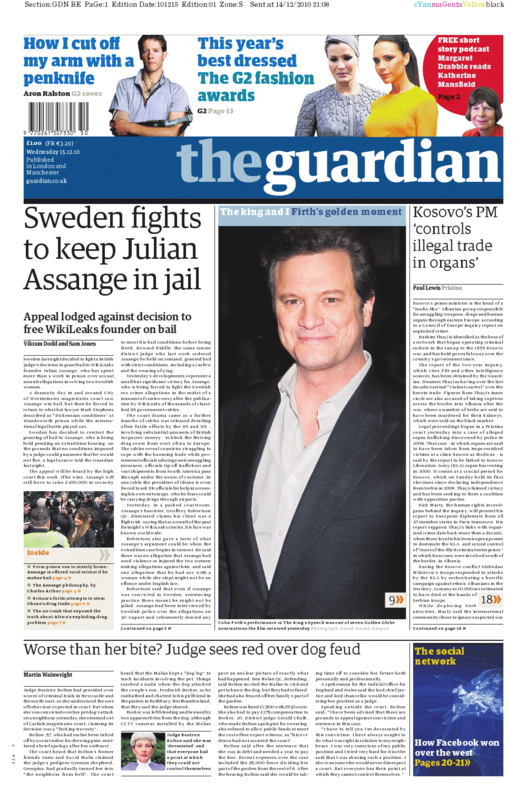 The Guardian – “Sweden fights to keep Assange in jail” The paper has led with the Wikileaks cables almost every night for the past three weeks and tonight the website itself is the news. The media circus that has surrounded the potential extradition of Assange has been ridiculous and I think the press has been very self-indulgent. Generally the story is an accurate retelling of the day’s events but I question whether, with 250,000 leaked cables to trawl through, they couldn’t have found some real news. Every time the Independent gets a scoop a little part of me screams with joy. It’s like you are supporting Accrington Stanley against the might of Manchester United and they have just scored a goal against the run of play. 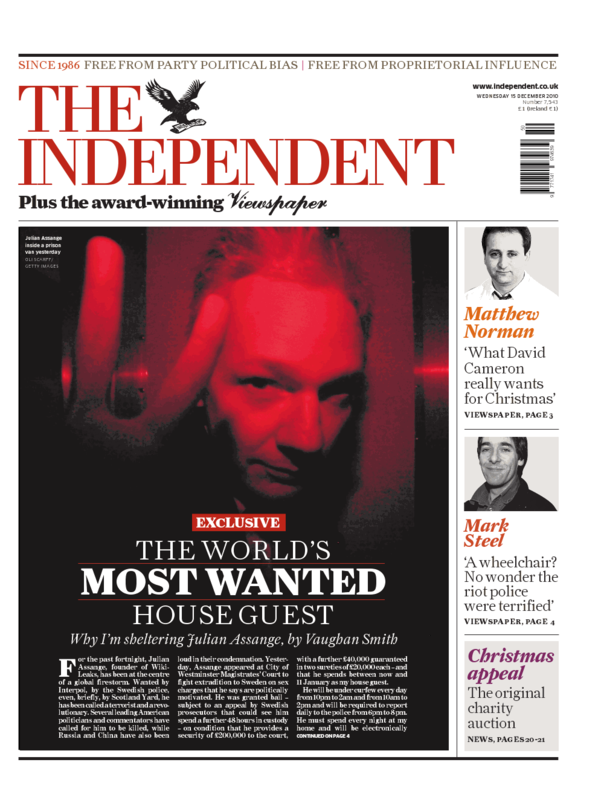 Tonight the paper leads with a comment piece from Vaughan Smith, the man behind the Frontline Club and also the man sheltering Julian Assange. A big scoop that the piece went to the Indy and not its big bully of a brother The Guardian, but sadly the article itself is not great. It doesn’t come across as a comment piece at all, more like a news story. 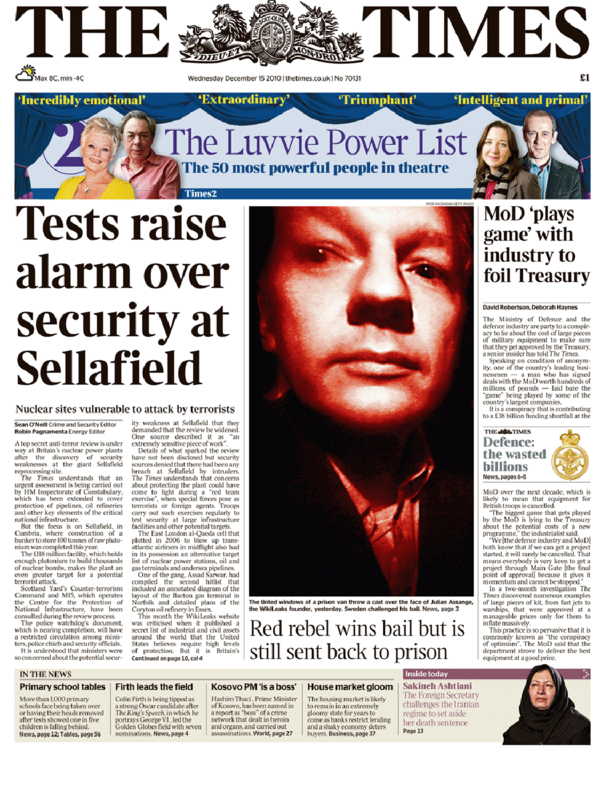 The Times – “Tests raise alarm over security at Sellafield” The paper leads with anti-terror reviews being undertaken at Britain’s nuclear plants. I hate to sound stupid, but shouldn’t they already be doing these reviews? Apparently Sellafield, where they hold enough plutonium for Saddam Hussein to have been happy, is under threat and under protected. If you only read one: The Telegraph for leading with the most interesting issue. This entry was posted in Front pages catalogue, The Financial Times, The Guardian, The Independent, The Telegraph, The Times and tagged abandon, assange, babies, frontline, julian assange, savings. Bookmark the permalink.